We really dislike some online merchants who are selling similar items - but they are made from a less expensive synthetic glass or acrylic. Those less expensive knobs fade over time and look cheap - even from across the room. 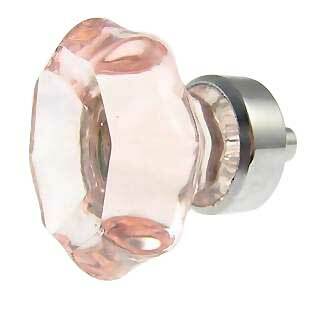 This depression pink contemporary crystal knobs are wonderful. Subtle and beautiful, this clear knob brings warmth and light into any room. These contemporary glass knobs are hand made in light pink glass and the exact shade can vary over time with each hand made batch. These knobs work perfectly as cabinet door handles or as drawer pulls and knobs. These will also make excellent design accents to contemporary stainless steel appliances or granite and marble counter tops. These crystal clear contemporary glass knobs are perfect for furniture drawers, bathroom vanities, dressers, furniture restoration, cabinet door handles and drawer pulls. Both beautiful and durable, these imported contemporary glass knobs are made from the finest silica glass and were individually hand made by professional glass workers. These glass knobs have an octagon shape and are set in a polished nickel base. These larger cabinet knobs and have a have a diameter of 1 3/8" (35mm) and a projection of 1 1/16" tall (26.9mm). These cabinet door handles are sold individually and they come complete with the hardware, too. The bolts are 5/8 inches (16 mm) long.